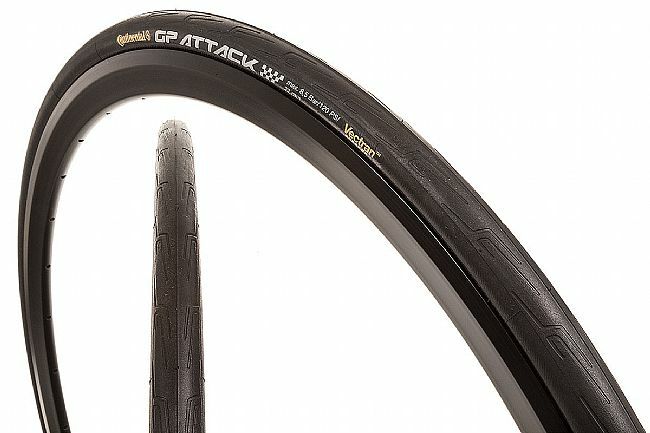 Continental's Grand Prix Attack is a new breed of race tire. It's specifically designed for the front wheel, using a narrower 22mm contact patch for efficient aerodynamics and precise handling. The Grand Prix Attack Tire is available in 700c x 22mm (22-622 ISO) and features a 3 ply casing for a total of 330 TPI. 110-120 recommended PSI. Claimed weight: 175 grams. Black.